My Favourite Quote: "Spock, you are fully capable of deciding your own destiny. The question you face is - which path will you choose. This is something only you can decide." Did You Know? - The man who played George Kirk, James T Kirk's father, Chris Hemsworth, also played Thor in the film of the same name and in The Avengers (2012). The mother of James T Kirk is played by Jennifer Morrison, who currently plays Snow White's daughter in the television series Once Upon A Time. Fate and destiny. I love the concept of 'what if'. Unfortunately, at present, we cannot prove or disprove that such a thing as destiny or fate exists. However, we humans love to speculate about it. Time travel is not a new concept. However, I greatly appreciate the creative and smarts of the producers and writers who have used this concept well in this film. Destiny, to believe that no matter what you choose to do, even if the journey is different, the end point remains the same. What is your stand on this matter? I think that while we may choose paths that steer us from heading towards our destined end path, we will still end up there. As they say, all paths lead to Rome. Though while I believe this, I also like to hope that we are the masters of our own destiny. Besides having a great interest in the concept of fate and destiny, I realise now that what I enjoy most about the television series I follow is the development of its characters. Star Trek has given us many great characters to love. I like to understand the history of how things came to be. And this film really is about two men and their connected destiny. I think at the heart of it, Star Trek is a 'bromance'. The story of how two men first became friends. Trekkers know of the brotherly bond and close friendship between Kirk and Spock, but none of the previous films or series ever focused on how they came to be friends. There are plenty of things I love about JJ Abrams' Star Trek. When I first watched the film, I was expecting plenty of heart pumping action and awesome graphics. What I didn't expect when I first watched the film in the cinemas, was to throughly enjoy the humour littered throughout the film. The witty exchange between various actors made me laugh out loud, even now after watching it countless times. The film has a lot of heart on top of being a great action film. The casting of these beloved characters was also spot on. Chris Pine's James T Kirk was a good combination of charm and confidence. I believe that we are shaped by the things that happen in our lives. And I could see the growth of the character of Kirk and Chris Pine's delivery of that growth was subtle but spot on. I have already seen how great an actor Zachary Quinto is from his performance in the television series Heroes. So his wonderful turn as Spock was no surprise to me. 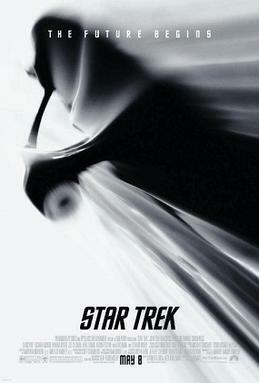 Although the story revolved around Chris Pine and Zachary Quinto's characters, Star Trek has always been a story about the entire crew of the Enterpirse. The remaining actors featured in the film all played a big part in making this Star Trek a great film. I especially liked Simon Pegg and Karl Urban's great comedic timing in the film. Some of the best lines of the film were delivered by these two actors. To be honest, there are so many underlying messages in the film that I feel overwhelmed to have to put it all into this one review. One day when I watch the film again, and if something else struck a chord with me, I would add on to the review. But for now, all that's left is to wait patiently for the sequel to be released.